• Support a good cause! Help build the Robin L. Boney Youth Center in Clovis, CA by entering to win a '67 Buick Skylark GS California Edition! We are giving away an ultra-rare, fully-restored, beautiful '67 Buick Skylark GS California Edition. Tickets are $10. each. Videos of the restoration can be viewed at www.youtube.com/user/altarchurch. Your tax-deductible donation can be made with debit/credit card by calling the Altar Community Church Office at 559-325-6828 or fill out an entry form online (www.thealtar.org). On behalf of the Altar Community Church and the future Robin L. Boney Youth Center, thank you for your time, consideration and support in this endeavor. $1.00 Raffle Off for a $150.00 Walmar Gift Card. To be raffled on 7/21/2012. We are a food bank that feeds the elderly, college students and the working poor. Want to see Lady Gaga in New York City? Raffle tickets at $10/each! Contact us for tickets! Families Helping Families of Jefferson, a family resource center for people with disabilities, is having our 3rd Annual Great Louisiana Staycation Raffle to raise money to host the Lose the Training Wheels program. It teaches children with disabilities how to ride a bike. The raffle will take place on June 15 & tickets are $5. There are 8 staycations you can win! The grand prize includes a stay at the New Orleans Sheraton Hotel, $100 Emeril's Gift Card, $100, Cafe Giovanni Gift Card, Zea's Gift Card, 2 Audubon Zoo/Aquarium passes, 2 Cemetery Tours, 2 Swamp Tours, 2 Mardi Gras World passes, 2 Steamboat Cruises, 2 Gray Line Tours, bowling, music & cocktails at Rock 'n' Bowl, Ye Olde College Inn Gift Card & 2 Cabildo passes! See our website or call 504-888-9111 to purchase tickets. This is a $10.00 raffle to help me ( David Hale ) to purchase a van to be modified for me to be able to drive from my wheelchair. Your ticket purchase also enters you to win 3 days and 2 nights of your choice in Orlando or Ft. Lauderdale, Florida. Then you will depart from West Palm Beach on Caribbean Cruise Line to the Bahamas for 3 days and 2 nights. For more info or if you want to participate please contact me via Facebook or by cell - 228-342-5312. Thanks to all and GOD BLESS !!! Ghost Hunter Adventures is going to St. Alban's Hospital in Radford, VA for our very first ghost hunter adventure. Ghost Hunter Adventures is a volunteer group working to raise money for kidney failure patients so they can get the transplant they need in order to help save their life. Come out and join us on our ghost hunter adventure on Jan. 21, 2011 and make sure you get your tickets for your chance to win our awesome prices. Integrity 2 is a non profit organization that helps families in need, mentor teens, tutor children in after school program, summer programs, job skills, GED classes, Senior Citizens programs and activities and provide scholarships for at risk youth who desire furthering their education. Enter to win 2013 Harley 883 & Carry on the memory of SSG Jamie Jarboe WWW.JJFHARLEYGIVEAWAY.COM 1 $10- 3$20- 5$35-10$50 - 25 $125 - 50$175 - 75 $250Begins: February 14, 2013 Ends February 13, 2014Winner selected; March 21, 2014 9:30amBefore SSG Jamie Jarboe passed away on March 21, 2012, he asked his wife to care for his soldiers. To carry on his memory and his wish Melissa Jarboe formed The Jamie Jarboe Foundation (Military Charity) to create Military awareness & rally up support for our Military active, wounded and retired. Jamie and Melissa were married on Valentines Day, each year on Valentines Day the Jamie Jarboe Foundation (JJF) will launch their JJF Harley giveaway. Love One Million Ways is a Non-Profit 501c3 ogranization that promotes healthy relationships and privides services to those in need. Primarily we do Relationship Consulting and Pastoral Care in addition to providing assistance by way of food, clothings, etc for individuals and families. Assists those who don't have the funds and or ability to pay at all or who can't pay standard fees. Show your support for children & young adults with special needs in the Northeast Ohio areaMatthew's Lending Library is a not for profit publicly supported children's charity established in 1991 to provide adaptive therapy equipment and capability switch operated toys to children and young adults with special needs. Mountain Song Fellowship is selling raffle tickets for $20,000 towards the purchase of a car. We are selling only 400 raffle tickets for $100 each. The raffle is being held to raise money for Arkansas Senior Citizens who have the largest number per capita of any state who go to bed hungry each night. The drawing will be held on February 11, 2011. Please send your check for $100 dollars to PO Box 9415, Fayetteville, AR 72703 include your name, address and phone number. Upon receipt of your check within 24 hours we will mail you the attachment of your stub and a copy of your stub with a number between 001 and 400. The drawing will be held at the Washington County Courthouse. Thank you for helping us help others. If you have any questions please contact Pastor Cook at 501-952-7066. You could be a winner by helping support the Onset Beach Jazz Festival and the rich history of jazz music!!! We are a non-profit service organization. All the money we earn from fund raising goes back into the community. We provide scholarships, parks, eyeglasses, hearing aids and more. We have donated 1000's of dollars to our library, community center, food bank, little league park, skateboard park, toddler park, downtown Christmas decorations, beautification efforts and our police department. We also hold a free Community Christmas Party, organize the community parade and hold a turkey bingo, golf tournament and straw maze every year. We are raffling off a 1954 Ford Crestline Crown Victoria. It has been fully restored. The tickets are $5.00 each. 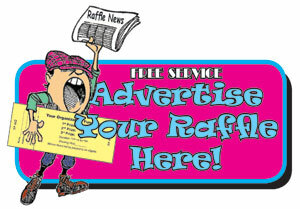 We will be holding the raffle on December 3, 2011 at 4pm at the Quincy Community Center. or more than 75 years, the Rabbinical Seminary of America, popularly known as Yeshiva Chofetz Chaim, has been fulfilling its two-fold objective: to provide young Jews with an outstanding Torah education of the highest caliber, and to equip them with the training and commitment to serve in leadership positions for Jewish communities throughout the world. With 90% of the yeshiva's rabbinic graduates entering communal service, RSA is at the forefront of a Torah renaissance, producing the rabbonim, principals, teachers and outreach workers who are revitalizing Jewish life on this continent and beyond. More than 100 communities in the United States alone are benefiting from RSA alumni, and the demand for qualified graduates continues to grow. tickets are $20.00 per ticket or 3 for $50.00. Drawing on March 8th at 7:00.Need not be present to win. Prizes are as follows:1st prize $1000.00, 2nd prize $500.00 and 3 3rd prizes $100.00.All proceeds benefit the operations of RLATo purchase tickets please contact Regina Luminis Academy. We are geared towards protecting the innocence of children. Please help end child abuse. Win $100,000! St. Andrew School Mega Raffle May 5, 2012. Over $180,000 in cash prizes will be given away in 75 drawings! Tickets are $100 each, and up to 10 people can purchase a ticket. Only 5000 tickets will be sold We accept checks, Mastercard and Visa. St. Andrew School is a Catholic PK-8 grade school in Murphysboro, Illinois. Call 866-862-7282 or go to saintandrew-school.org/raffle for more information and rules. Sportsman Give-a-way - featuring 33 prizes. Top prize is $10,000 and second is $5,000. There will also be fifteen $400 prizes and fifteen assorted rifles, shotguns and black powder. Do not have to be present to win. Purchase tickets online at www.statonhousefire.com using Paypal. Games open at 1PM and drawings begin at 2PM continuing every 5 minutes! Free food and beverages for ticket holders. Drawing held at the Pitt County (NC) fairgrounds in Greenville, NC. Complete rules online.